Our 4" x 6" Bennington stick flags are made from a high quality, silk-like polyester fabric. They feature a hemmed flag mounted on a black plastic 10 inch staff with a gilded spear point. These versatile stick flags can be used on tabletops and desks, to wave in parades, or to decorate flower arrangements. 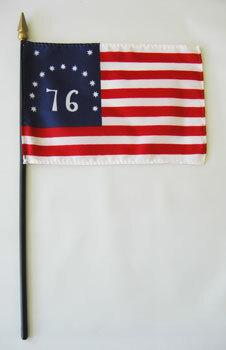 The Bennington Flag is a version of the American Flag associated with the American Revolution Battle of Bennington, from which it derives its name. Like many Revolution era flags, the Bennington features 13 stars and 13 stripes, symbolic of the 13 American colonies that were in a state of rebellion against Great Britain. The Bennington version is easily identified by a large '76' in the canton, recalling the year 1776, when the Declaration of Independence was signed. Another distinctive feature of the Bennington flag is the arrangement of the 13 stripes, with white being outermost (rather than red being outermost as in the current flag). Also, its stars have seven points each (instead of the current five).